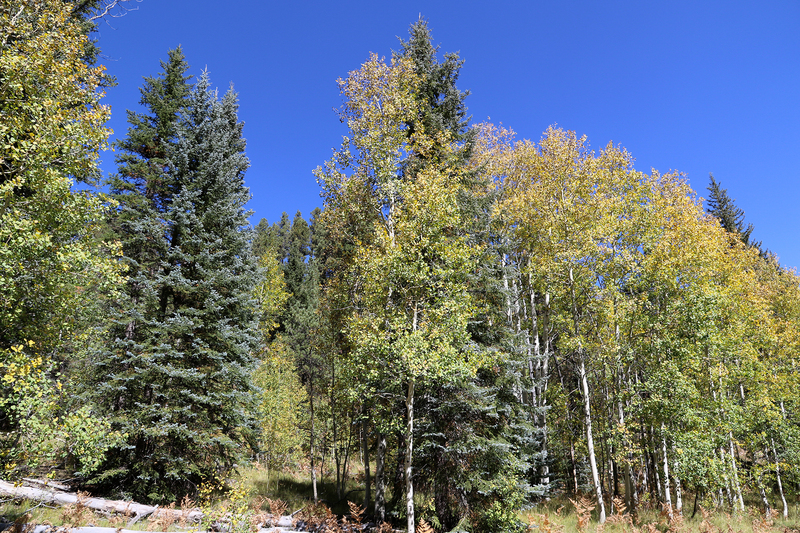 Late morning on Friday, September 16, Sean and I climbed into the Jeep and departed North Rim Campground for the Walhalla Plateau, which juts some fourteen miles south into the canyon from the end of the Kaibab Plateau. 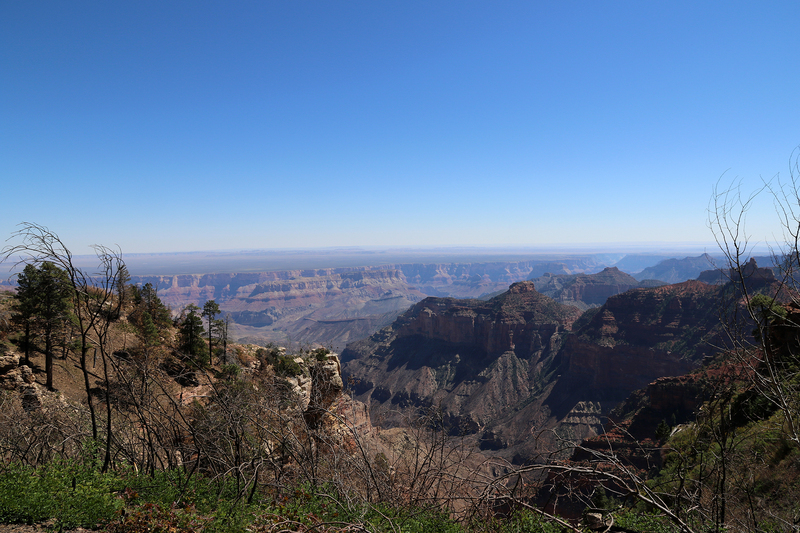 That morning at breakfast, we had seen the primary view into the canyon from the busiest point on the North Rim (the equivalent of driving into Grand Canyon Village and having a look from the South Rim), but now we wanted to spend the day seeing other aspects of the Grand Canyon from its North Rim. 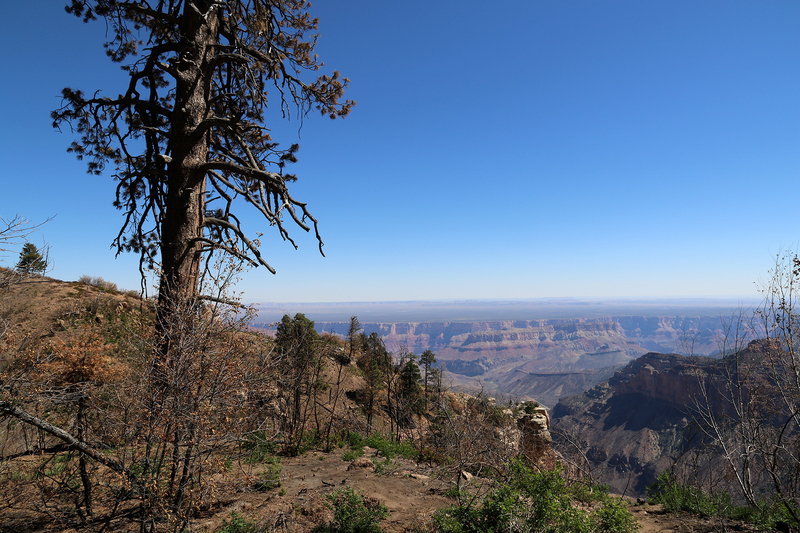 In part because of the Walhalla Plateau, the views from the various vantage points on the North Rim are more varied than those on the South Rim. 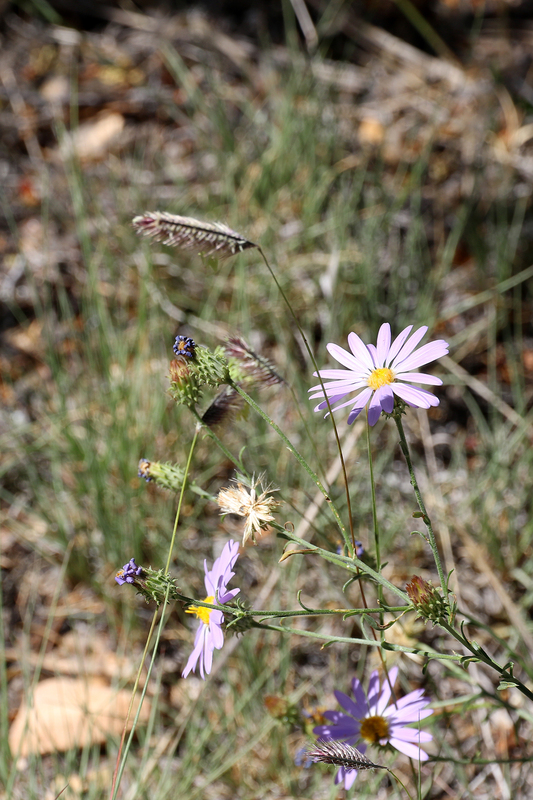 Our intention was to spend the greater part of the day on the Walhalla Plateau. 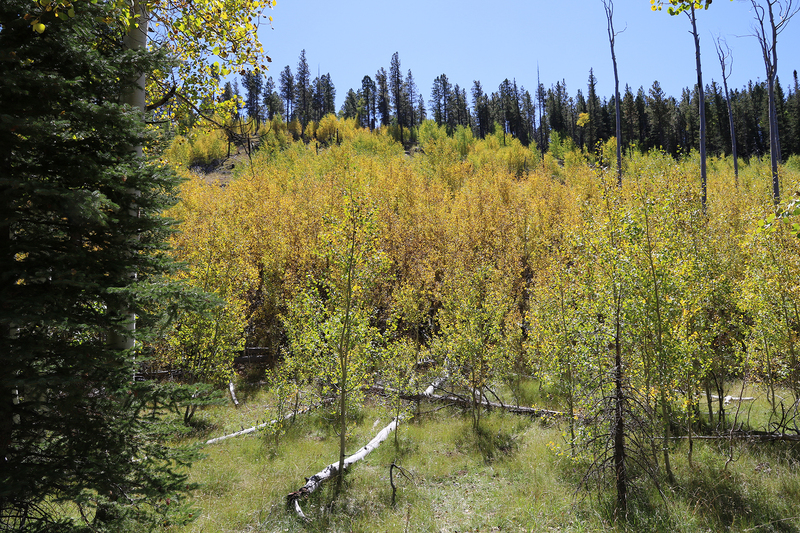 The road followed Fuller Canyon northeast on the Kaibab Plateau through stands of Quaking Aspen already turning yellow as autumn quickly approached. 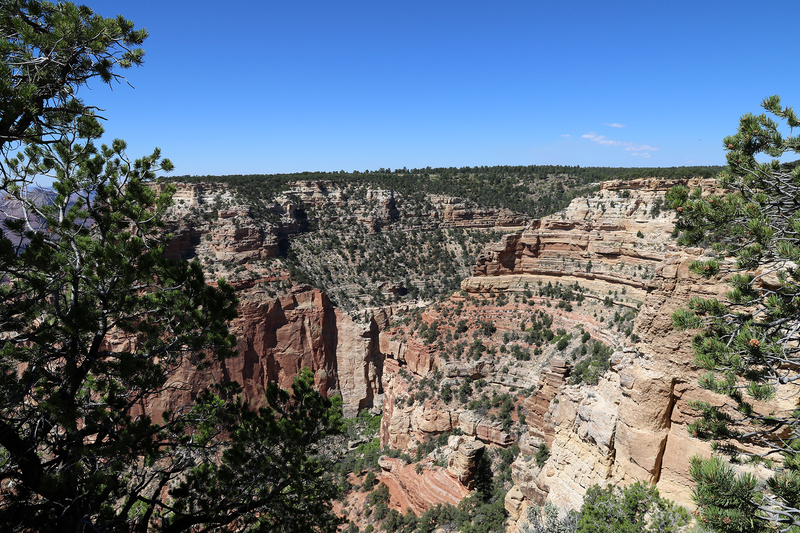 At a fork in the road, we turned south and climbed in a series of switchbacks onto the Walhalla Plateau. 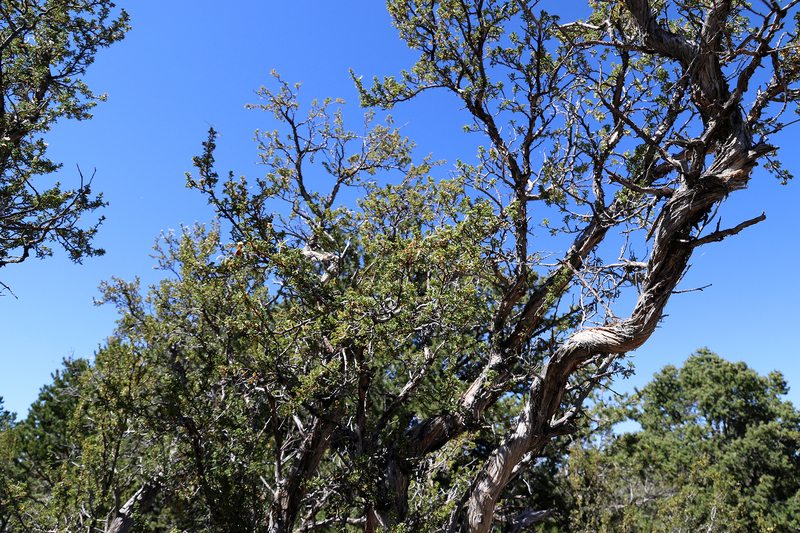 The road followed the western side of the plateau past several viewpoints. 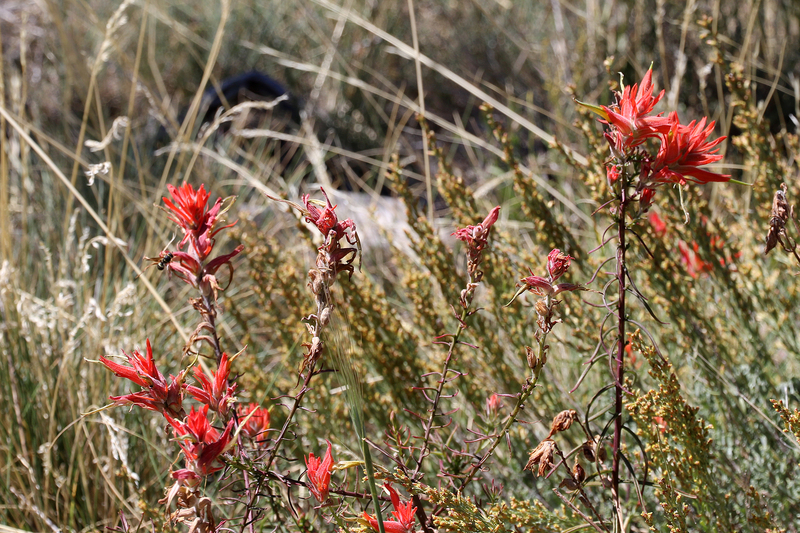 These we passed for now. 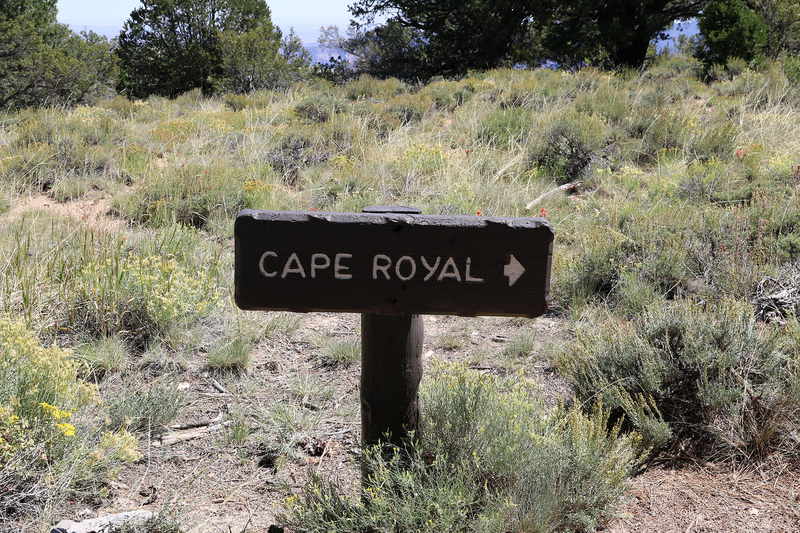 Our intention was to drive straight on down to Cape Royal at the end of the road and then make our way back up. 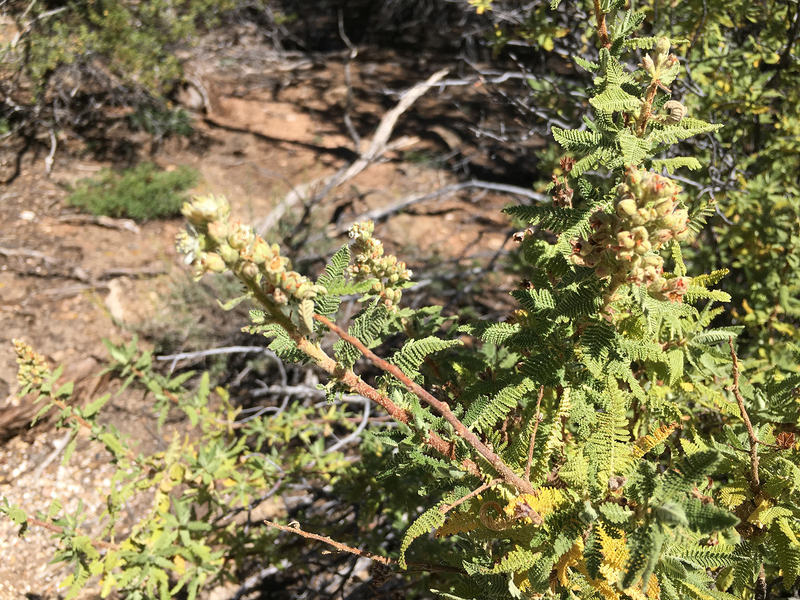 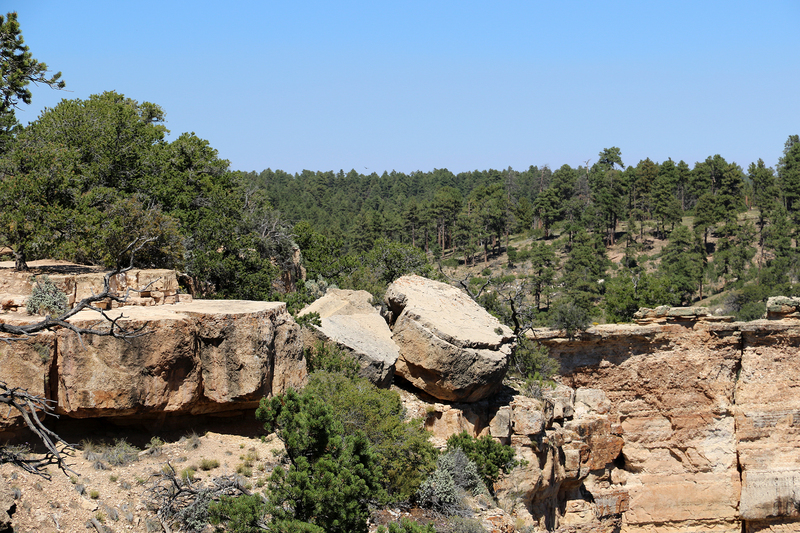 We did stop briefly, however, at an unnamed viewpoint where the Ken Patrick Trail crosses the road on its way from North Kaibab Trailhead to Point Imperial. 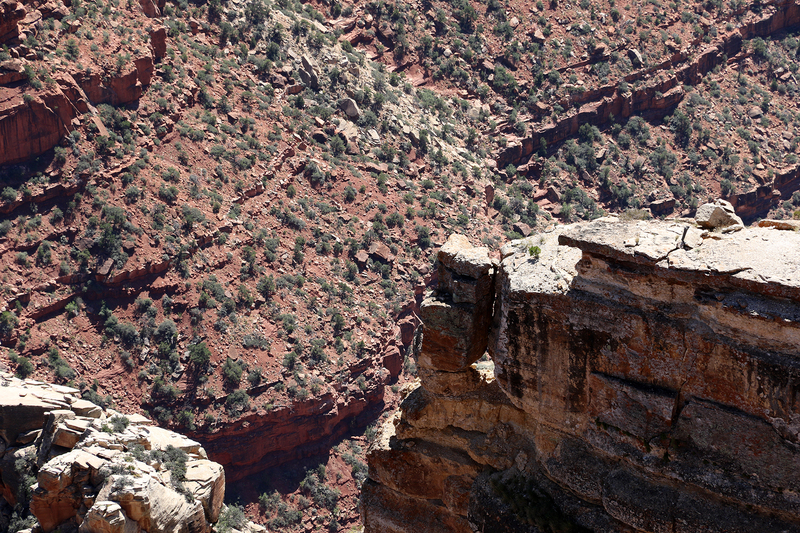 The Colorado River was visible far below as it prepared to exit the bottom of Marble Canyon just above the confluence with the Little Colorado River. 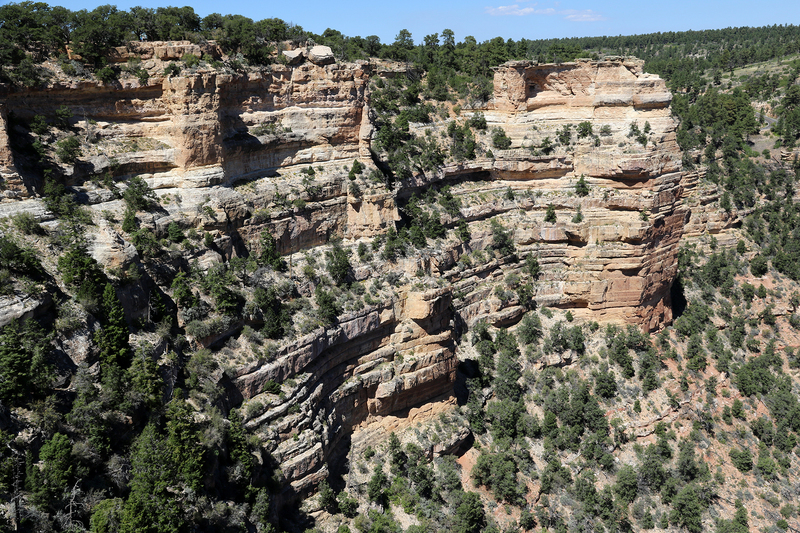 Here the Colorado flowed south before making a huge, over-ninety-degree turn around Cape Royal into the main chasm of the Grand Canyon. 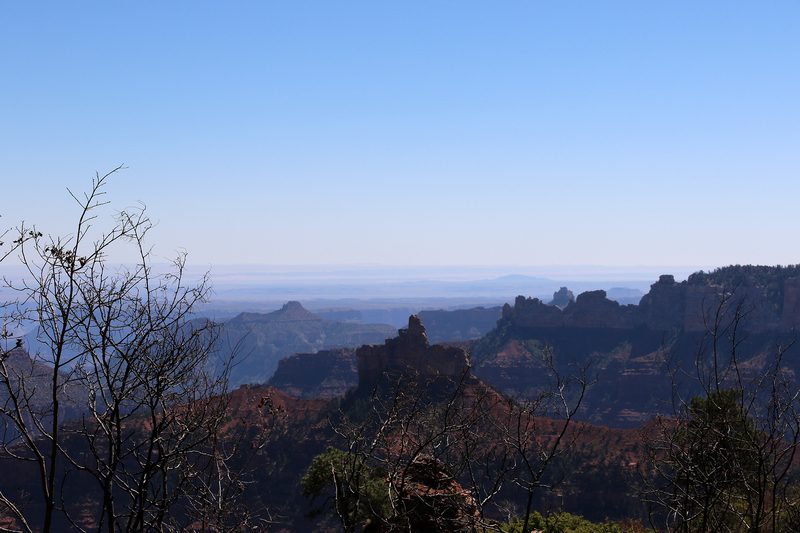 Beyond, we could see across the flat expanse of the Marble Platform and the Navajo Nation. 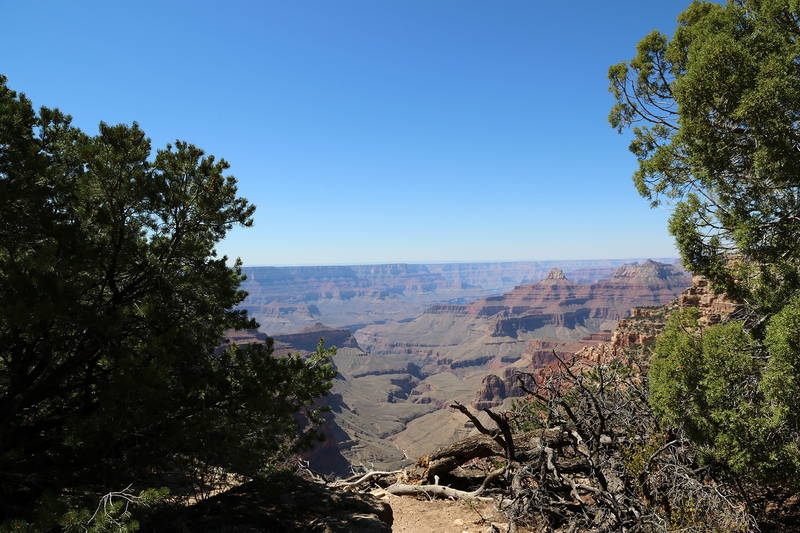 The road wound through the Ponderosa Pine forests of the Kaibab Plateau until it finally climbed up toward the parking area at Cape Royal. 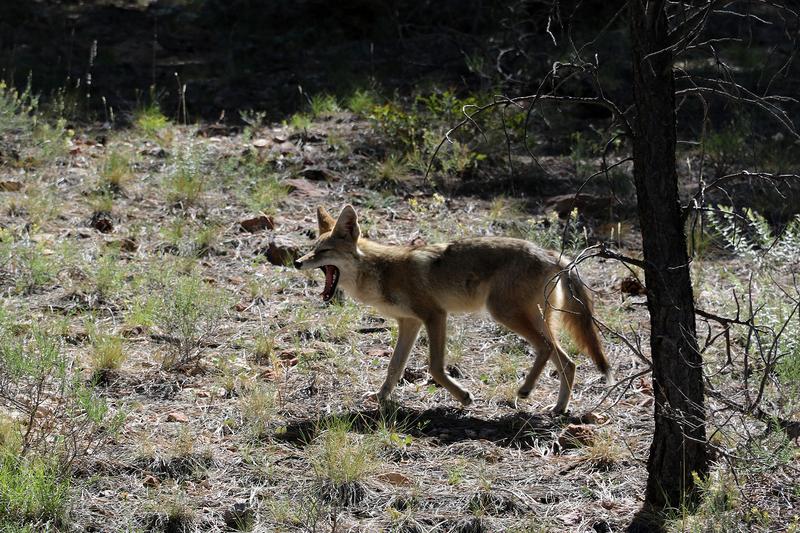 Near Cape Royal, we spotted a young Coyote going along and yawning. 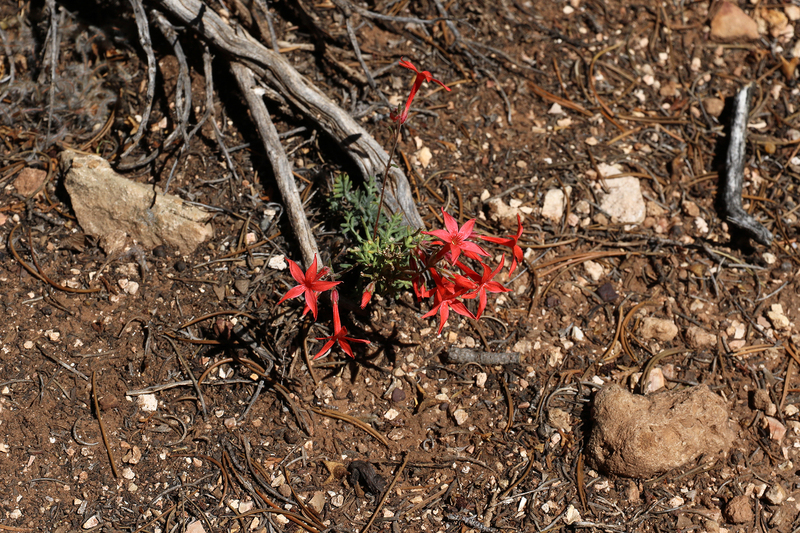 I was reading the outstanding Coyote America by Dan Flores on the trip, so I was thrilled to see one of his “little western song dogs” going along, going along. 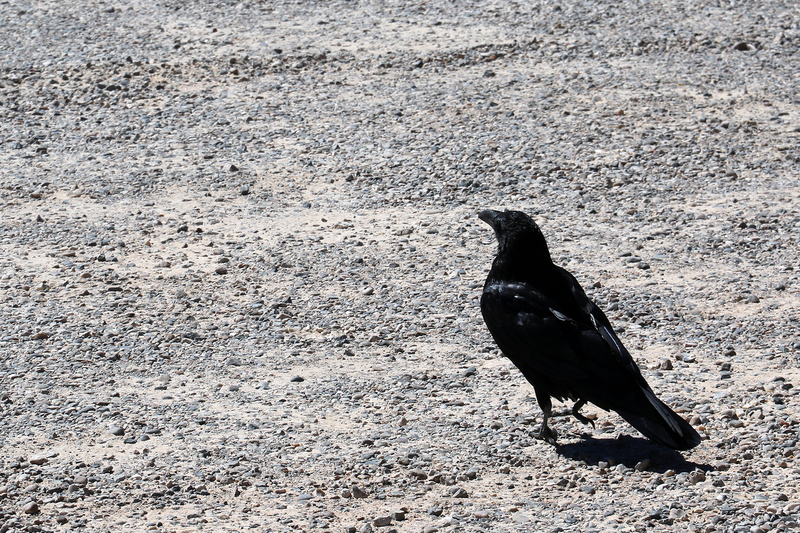 And in the parking area, we were greeted by a brazen Raven. 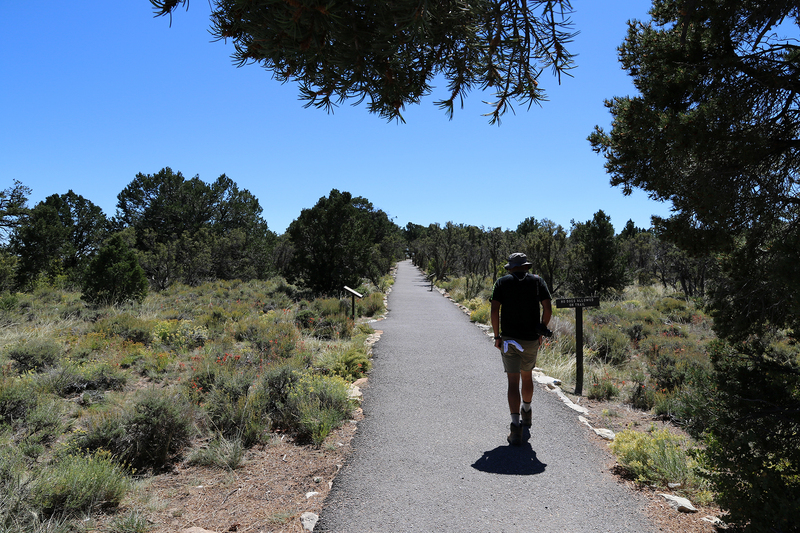 From the parking area, a 0.8-mile roundtrip paved path takes visitors through Upper Sonoran habitat (with interpretive signage) to several viewpoints. 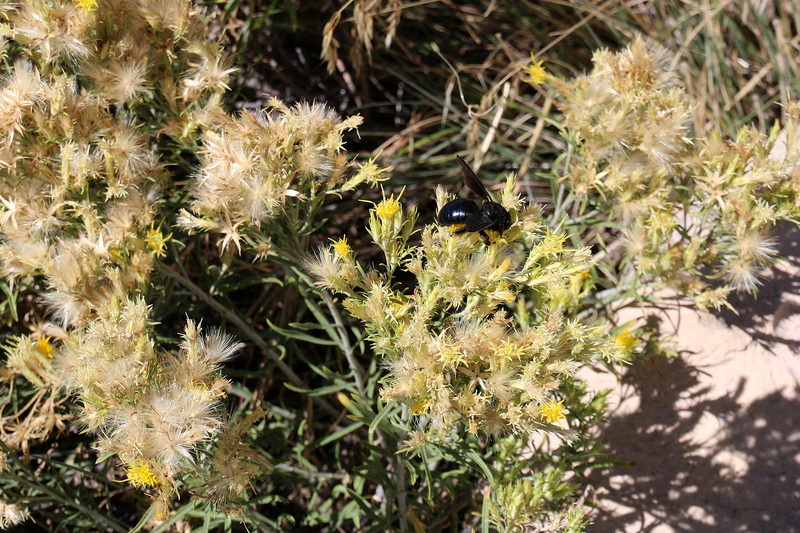 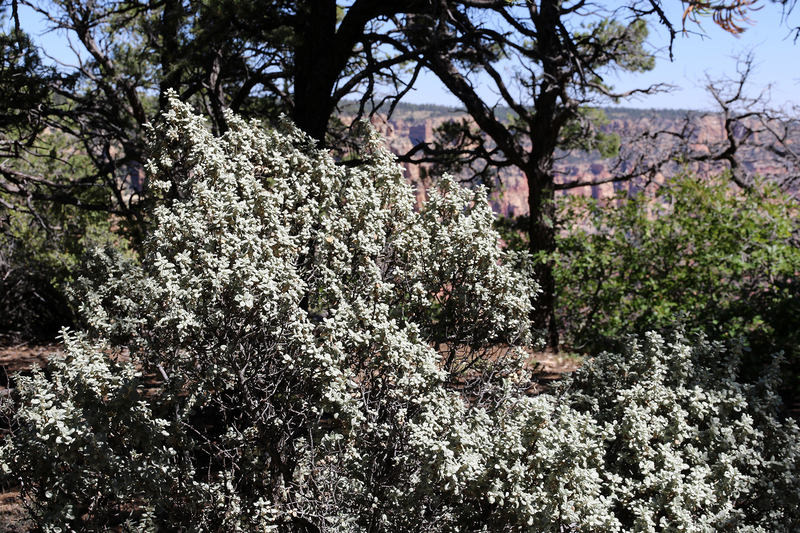 Here at the southern tip of the Walhalla Plateau, on the edge of the Grand Canyon, warm air flowing up from the depths of the canyon creates a more arid habitat than would normally exist at over 7,800 feet above sea level. 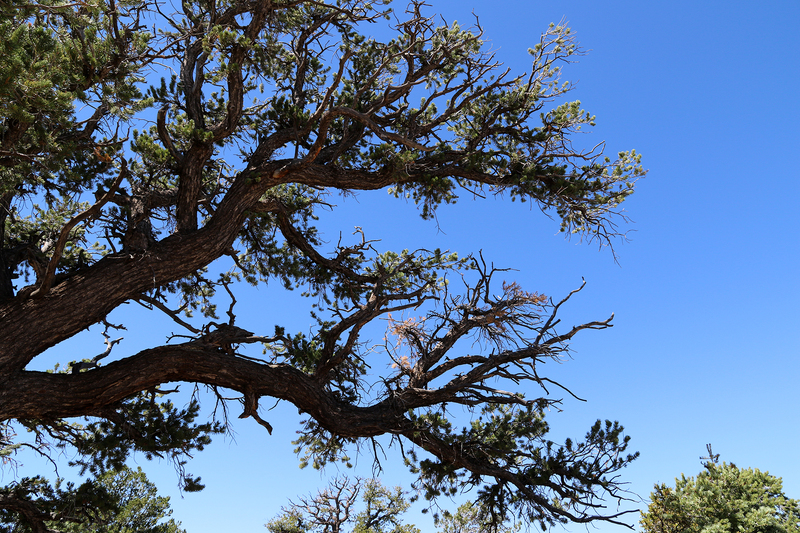 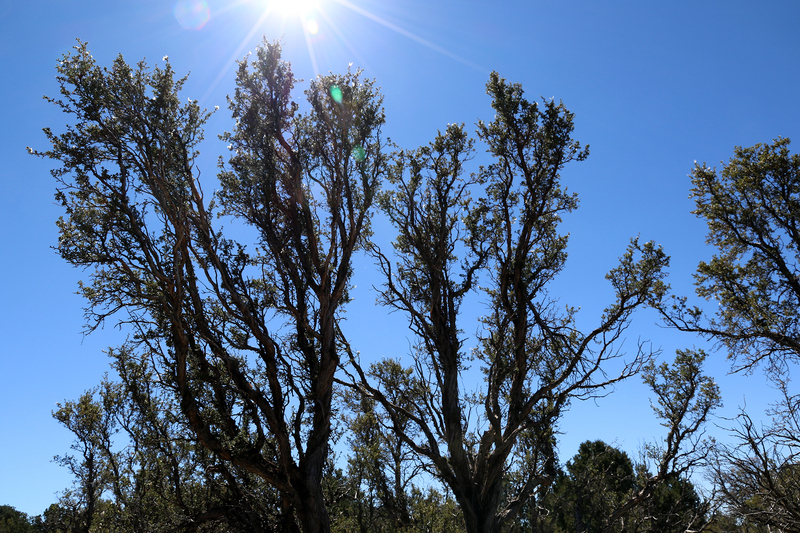 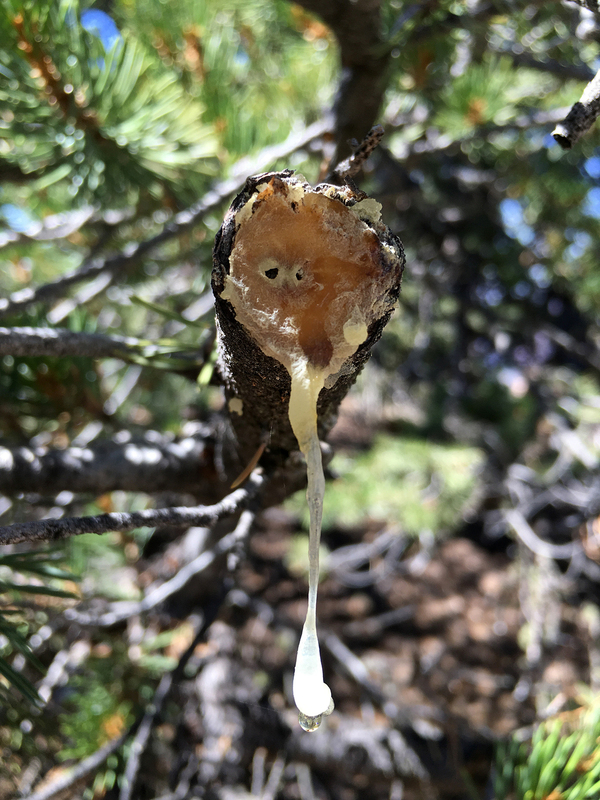 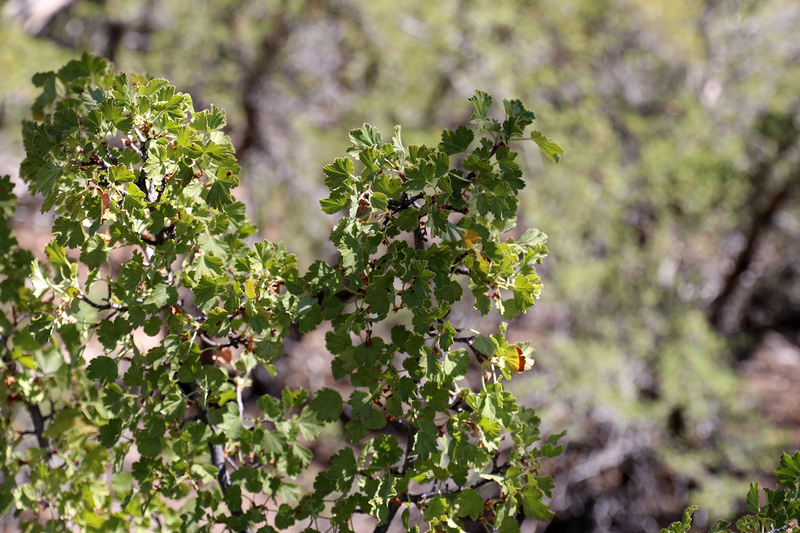 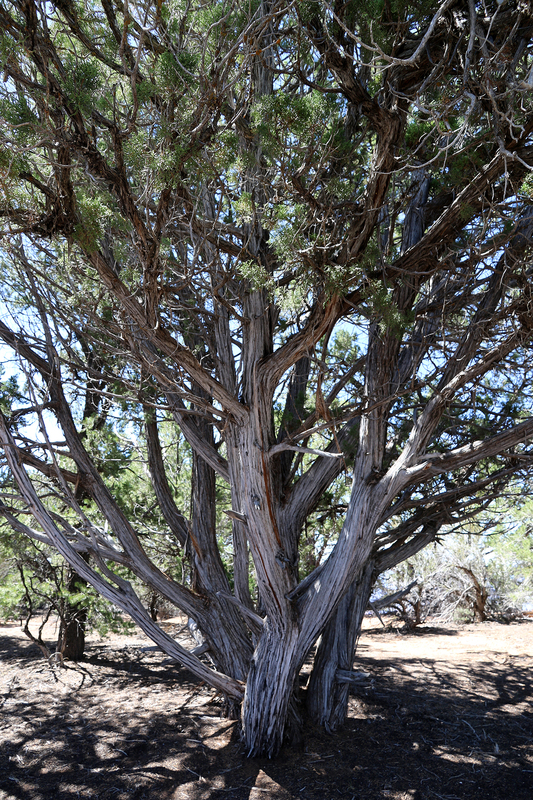 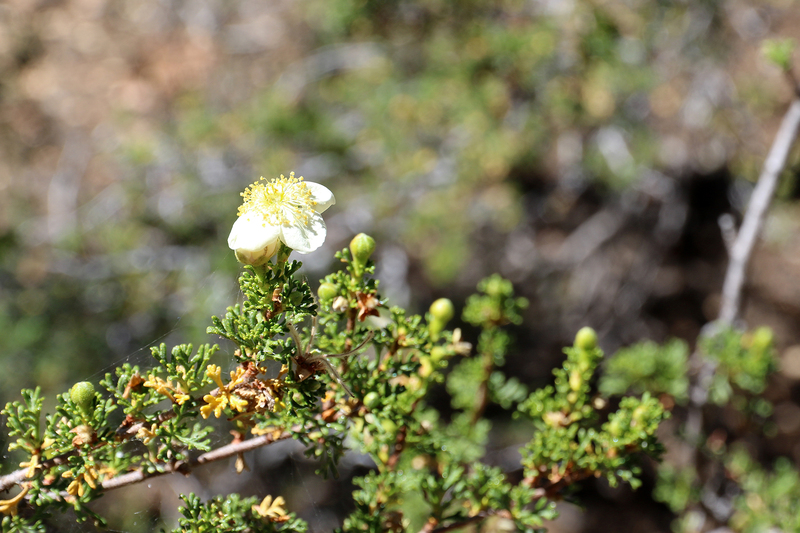 While the interior of the plateau is a classic Ponderosa Pine forest, here the dominant tree species are Utah Juniper and Piñon Pine. 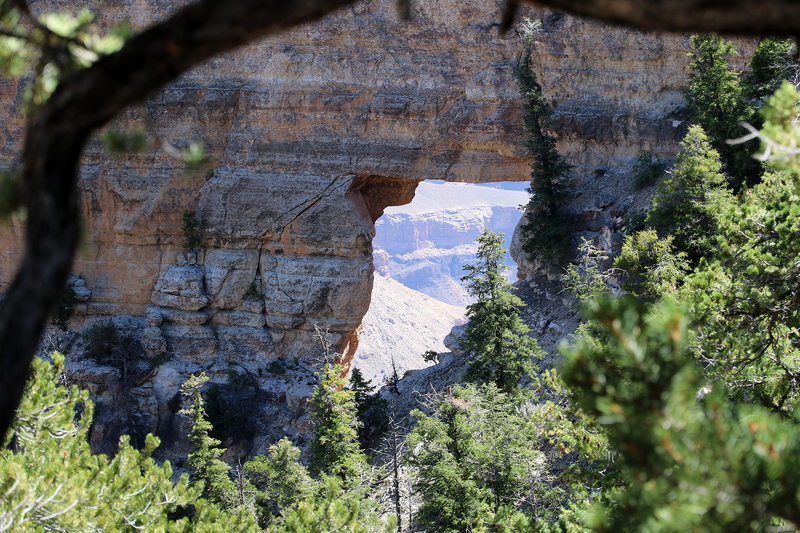 The trail trended southwest to Angels Window, a huge natural arch extending northeast from the plateau. 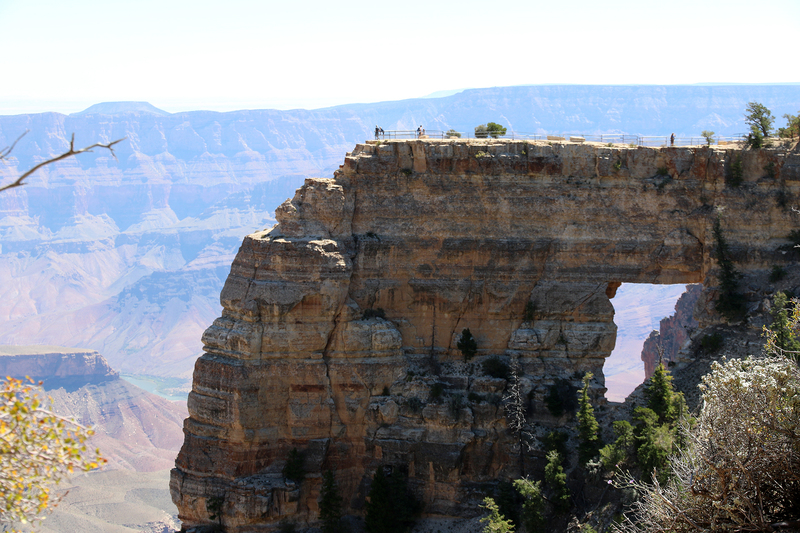 We could see other visitors standing out on top of the arch. 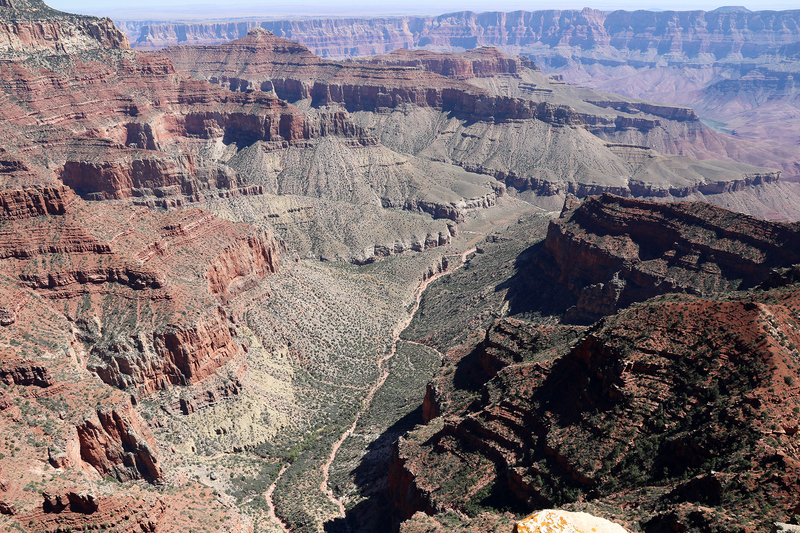 The trail approached the rim and again we could see the Colorado River at the point where it begins its westerly turn (near Tanner Beach and Tanner Rapids). 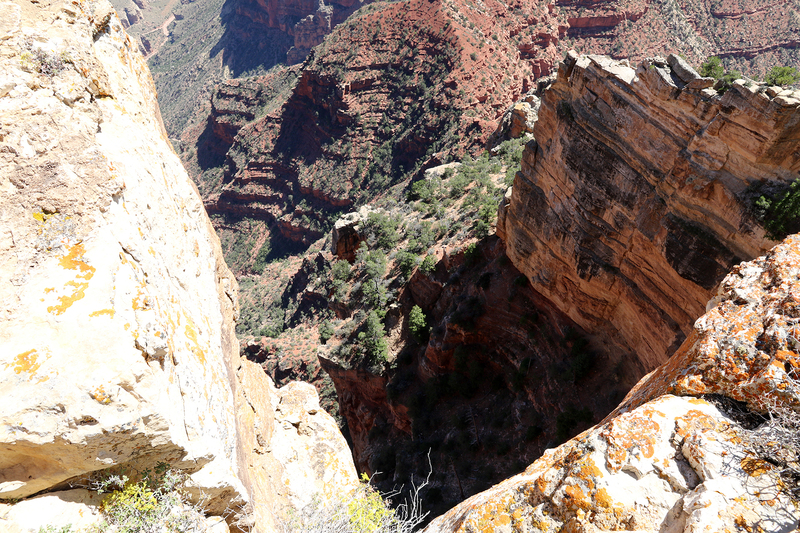 Then we ventured out onto Angels Window, where guard rails prevented small children and idiots from plunging down its vertical face on either side. 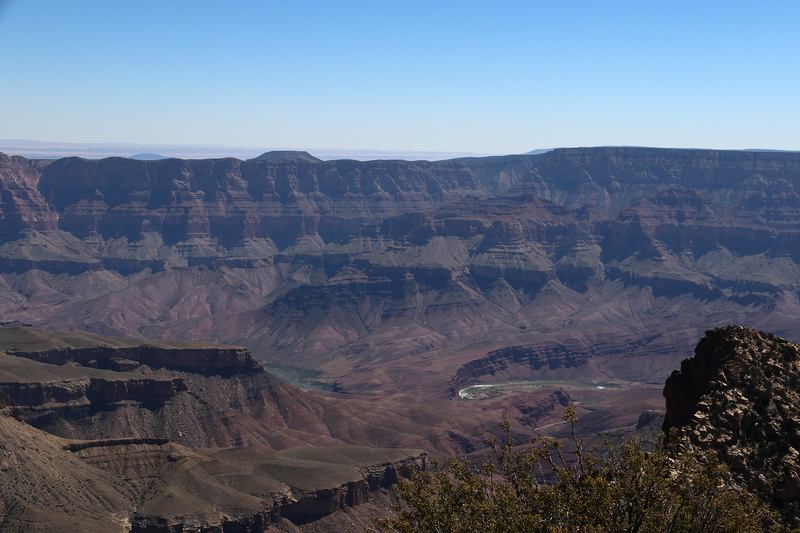 These were our first truly drama-laden views of Grand Canyon. 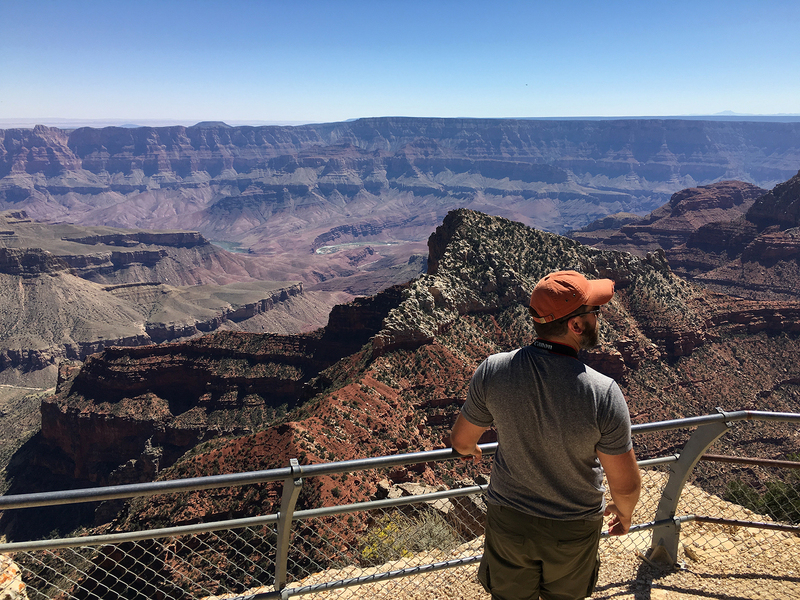 The view felt even bigger because so far as we’d come down Walhalla Plateau we’d been looking west over the comparatively narrow expanse of Marble Canyon and the confluence of the Colorado and Little Colorado. 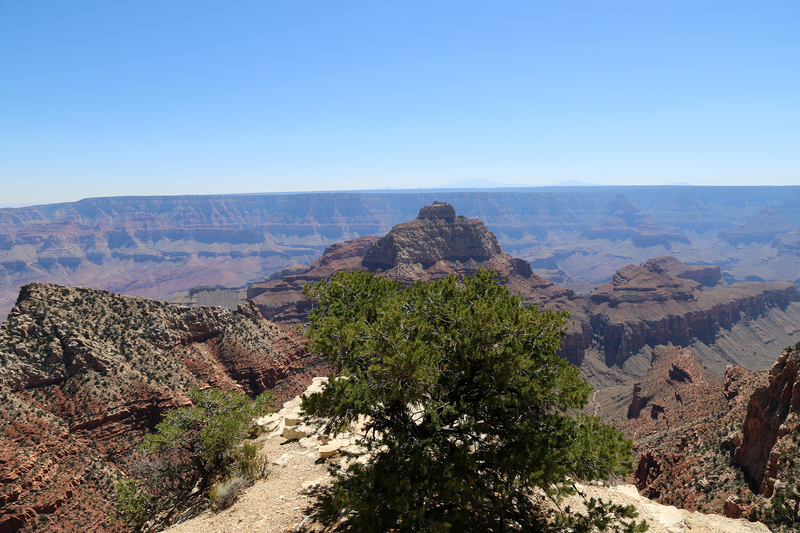 But as the river made its turn, the full expanse of the canyon was more apparent. 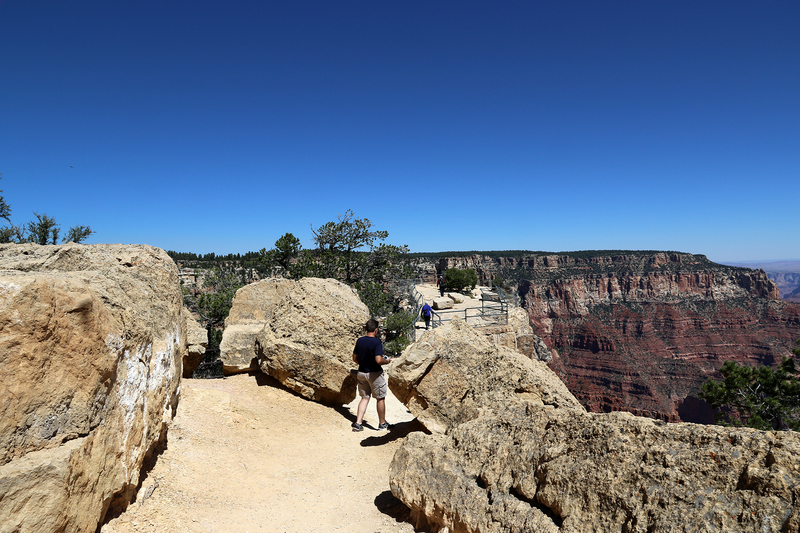 Although it wasn’t the canyon’s widest point, the view was huge. 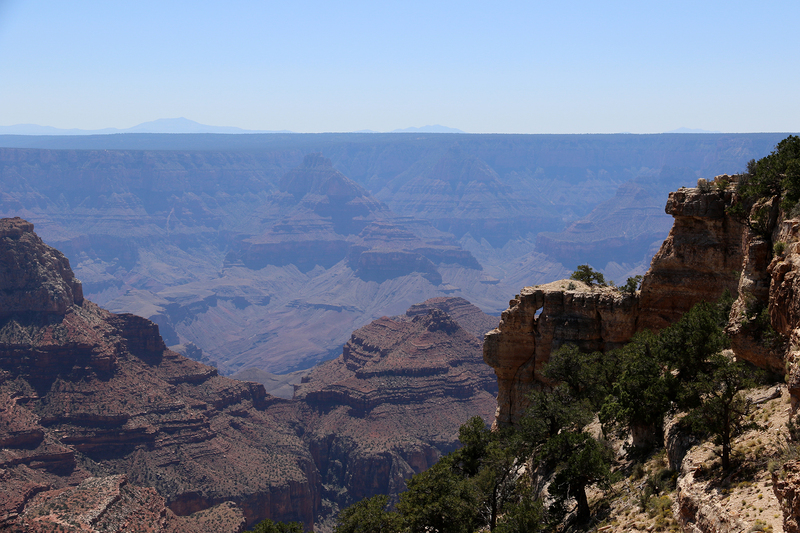 Even vantage points from the lodge, where the canyon is wider, felt less expansive because of the steep, beautiful side canyons all around. 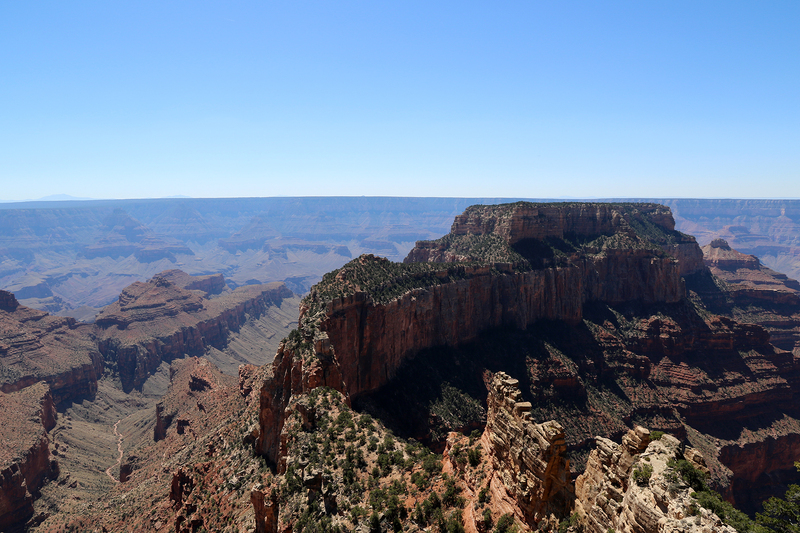 Here there was just an immensity to the sweep of the Grand Canyon. 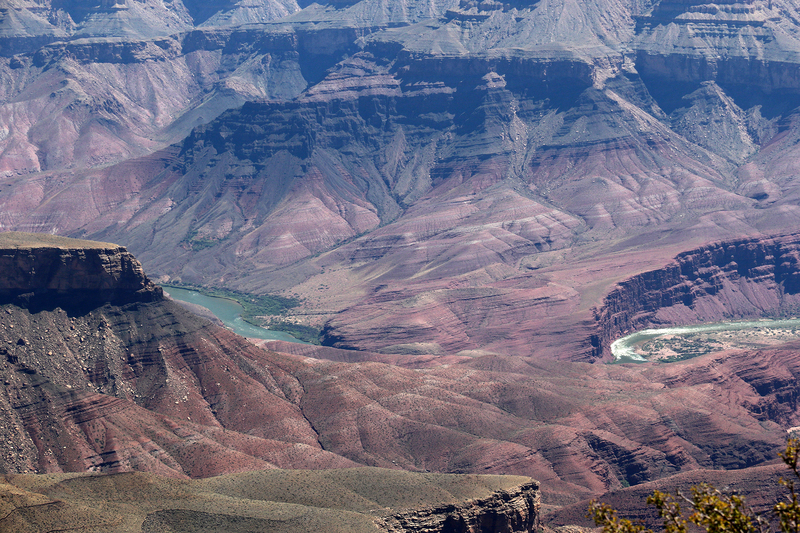 The Colorado River carved the Grand Canyon through a huge bulge at the lower end of the Colorado Plateau. 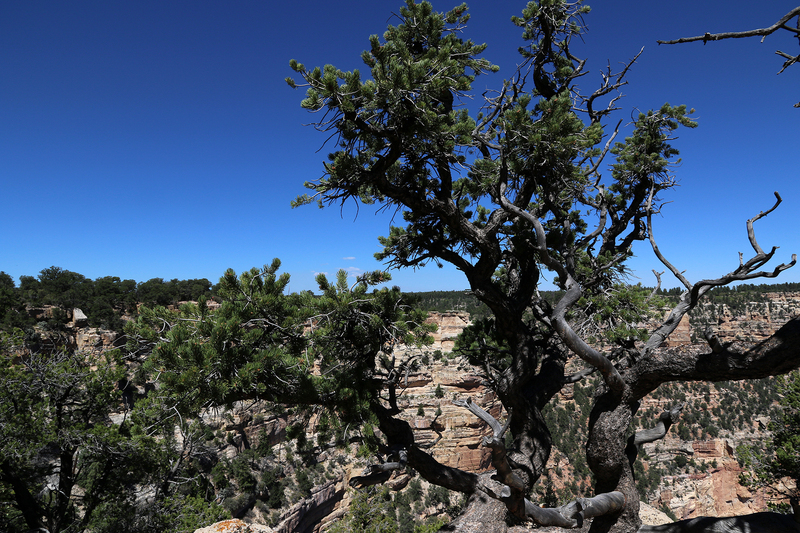 The Kaibab Plateau forms the canyon’s North Rim and the Coconino Plateau the South Rim. 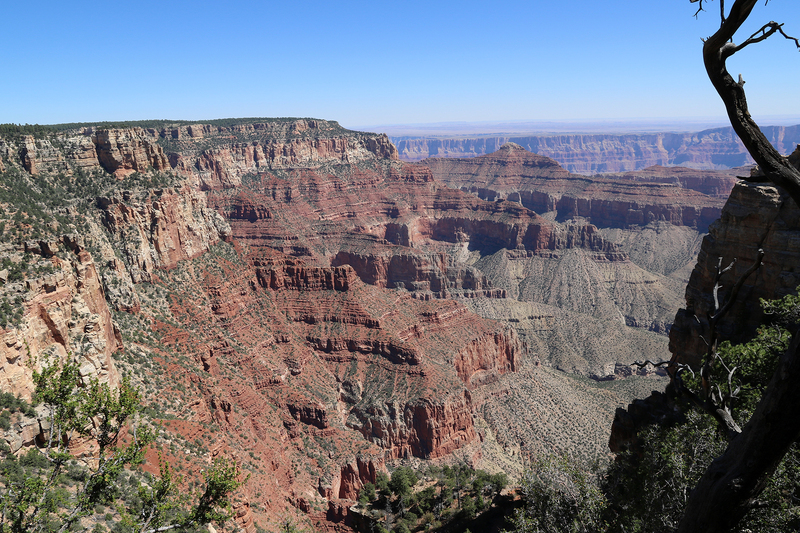 The entire Colorado Plateau at this point trends slightly downward to the south, so water at the South Rim flows away from the canyon, leading to the steeper walls of the South Rim. 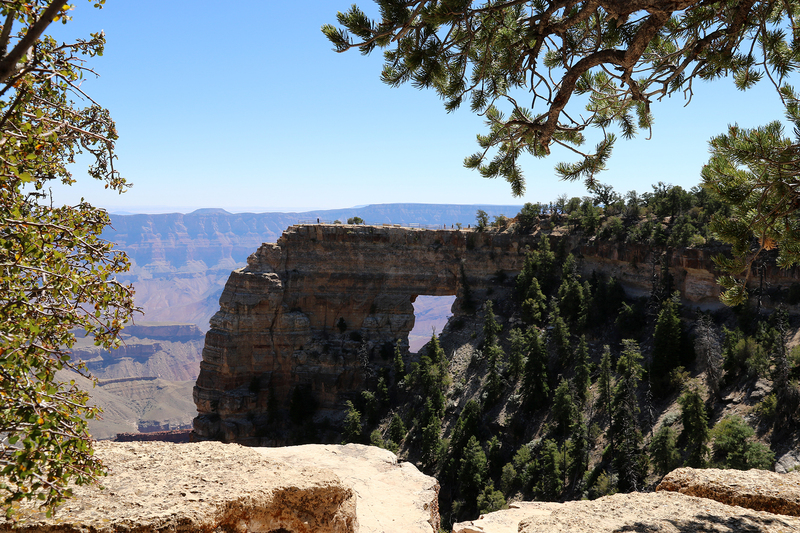 At the North Rim, water flows into the canyon, carving dramatic side canyons like The Transept, Bright Angel Canyon, and Roaring Springs Canyon. 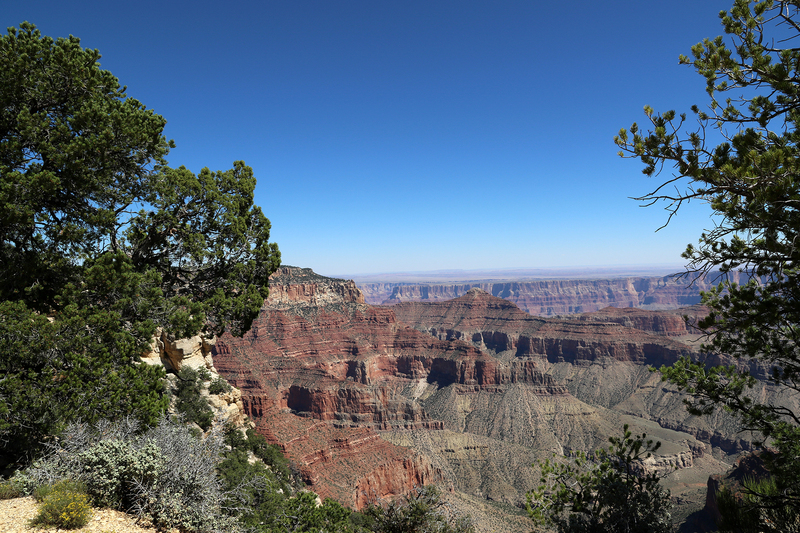 It is one of the reasons why views are more varied at the North Rim. 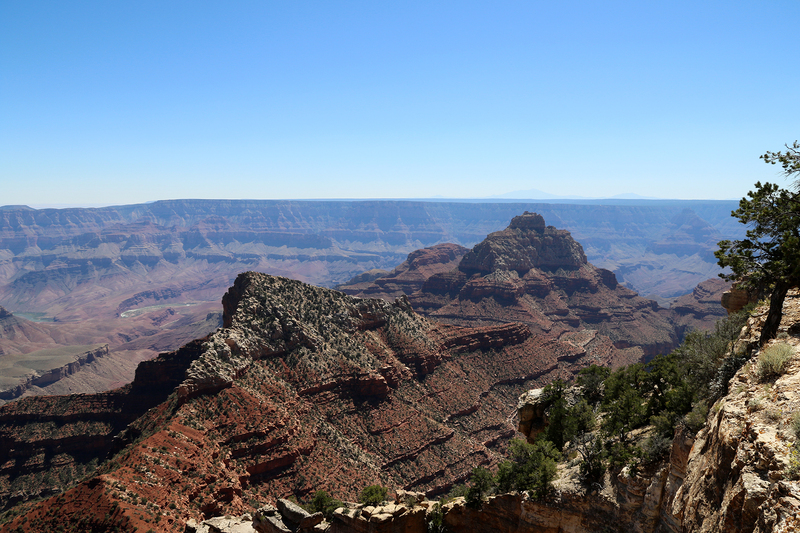 The North Rim is also, both because of the general downward trend and because of the Kaibab Plateau’s uplift, 1,000 feet higher than the South Rim. 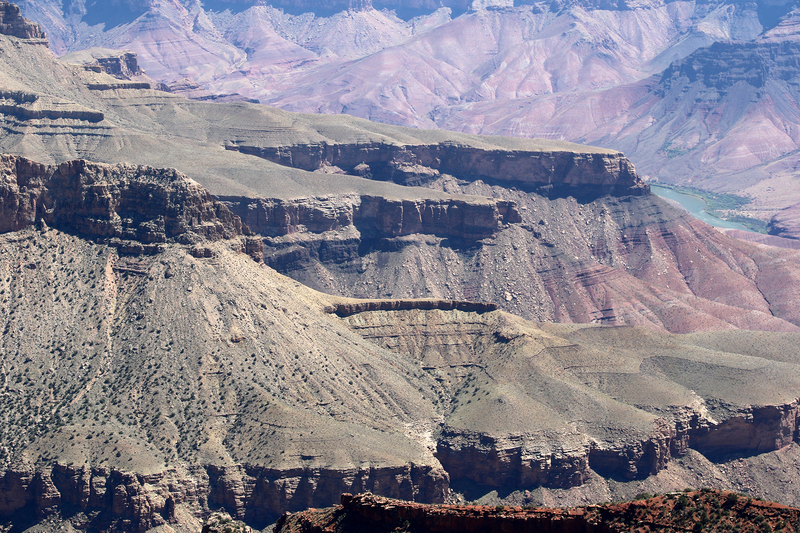 Geologists know that the Colorado River flows through the Grand Canyon. 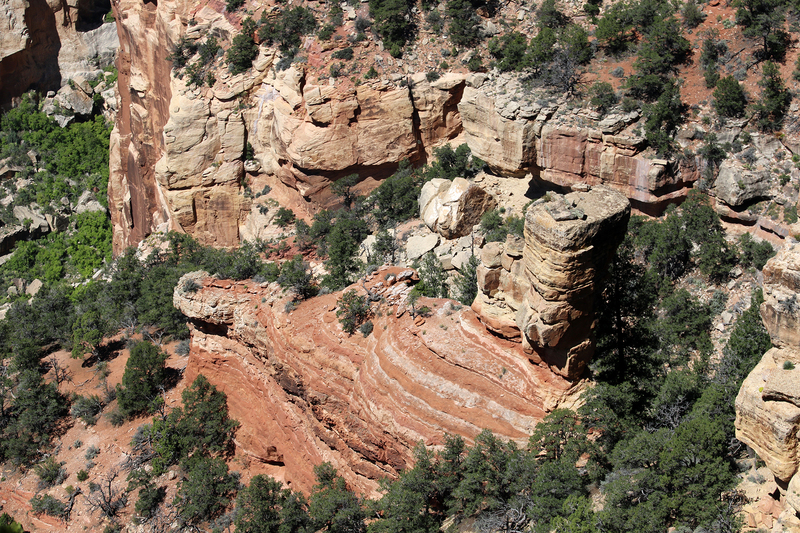 They know the canyon could not have begun forming any more recently than 70 million years ago. 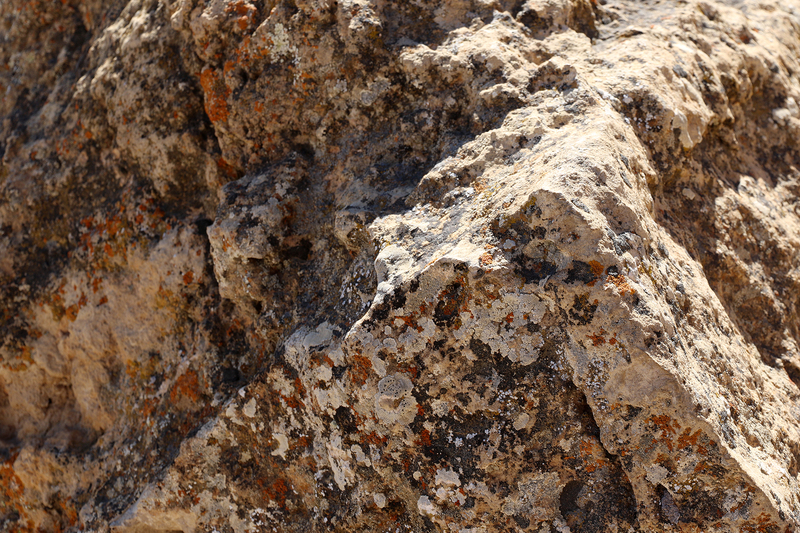 Many of the details beyond that are disputed. 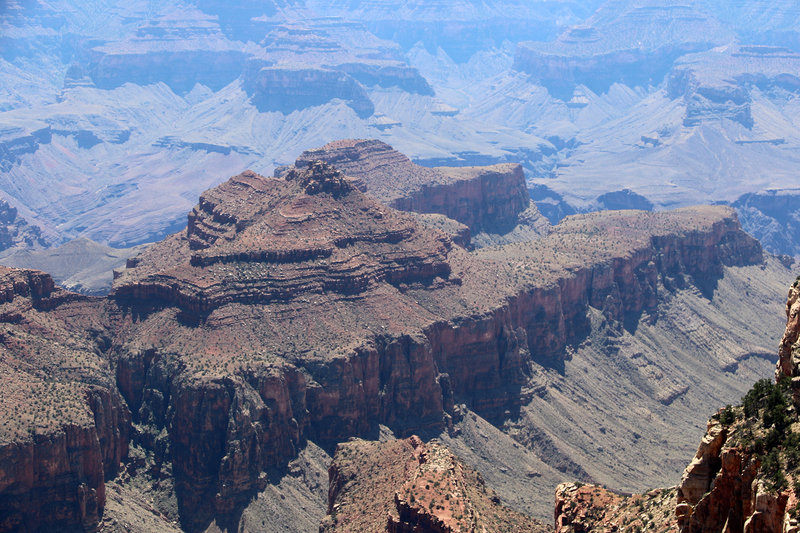 It is possible, even likely, that the Colorado River flowed in reverse while it carved the main thrust of the Canyon. 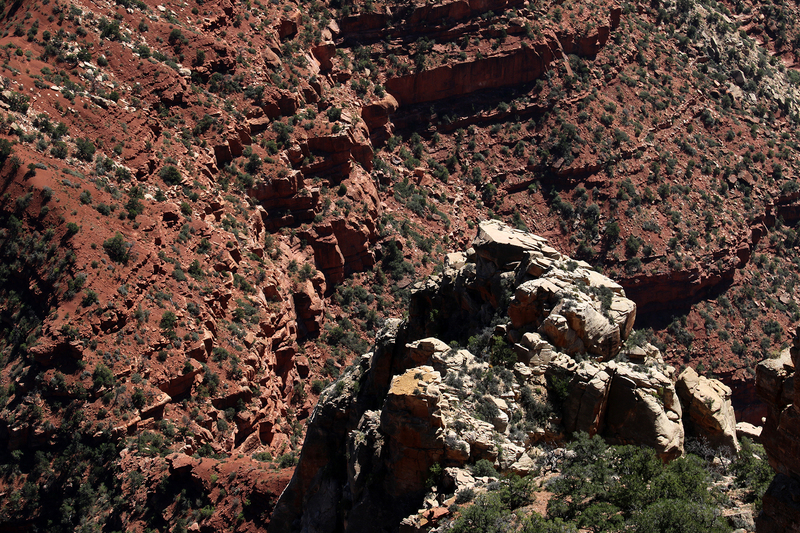 A proto-Colorado River may even have slowly carved the canyon from one direction while lost ancient streams carved it from the other side until they met in the middle. 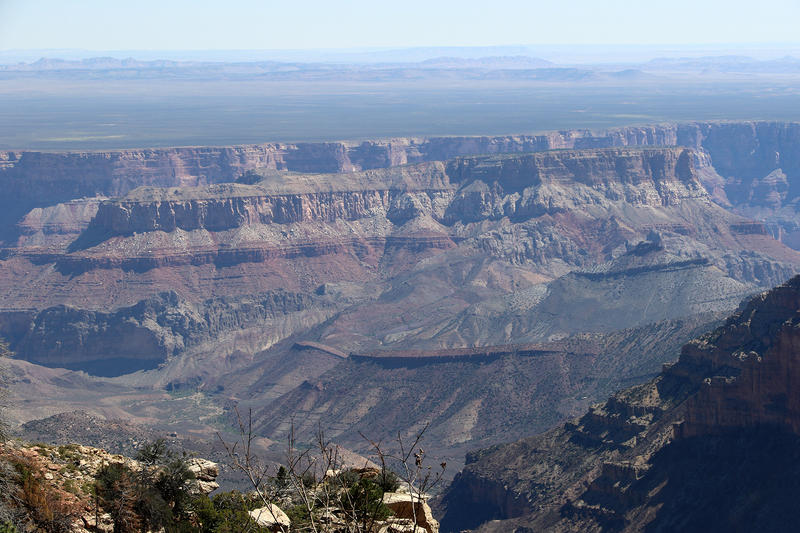 Part of the reason for the uncertainty is that the Colorado has moved so much sediment from the canyon to the Gulf of California that we are missing whole multi-million-year chapters of the canyon’s history. 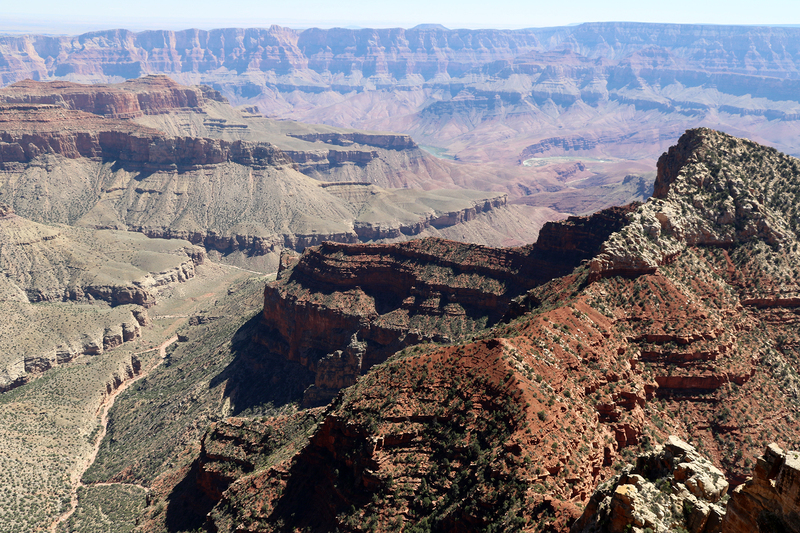 The Grand Canyon’s very massiveness masks its earliest history. 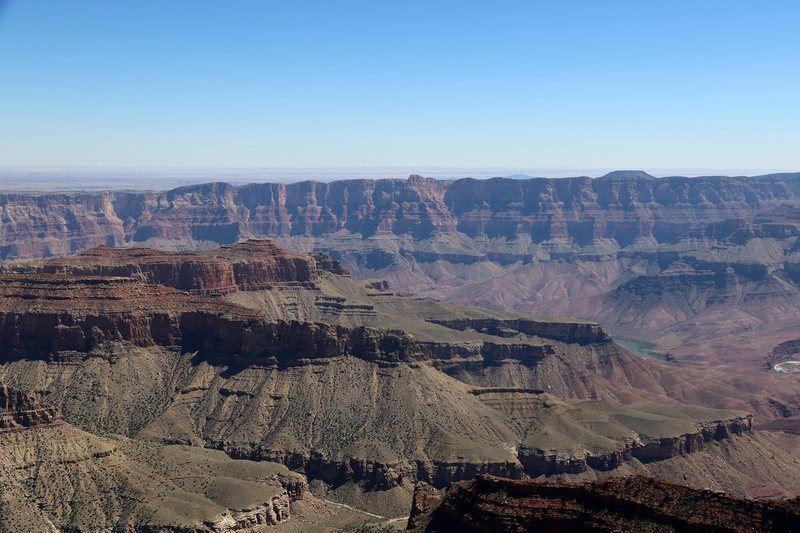 The scale of the Grand Canyon is daunting, some 277 miles from one end to the other. 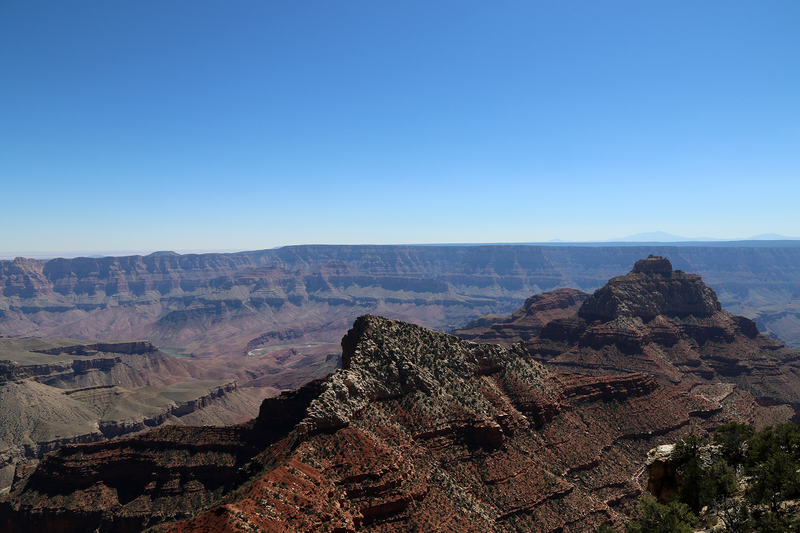 Were there a highway where the Colorado River is, an automobile traveling seventy miles per hour would take four hours to drive from Lee’s Ferry at the eastern end to Grand Wash Cliffs at the western end. 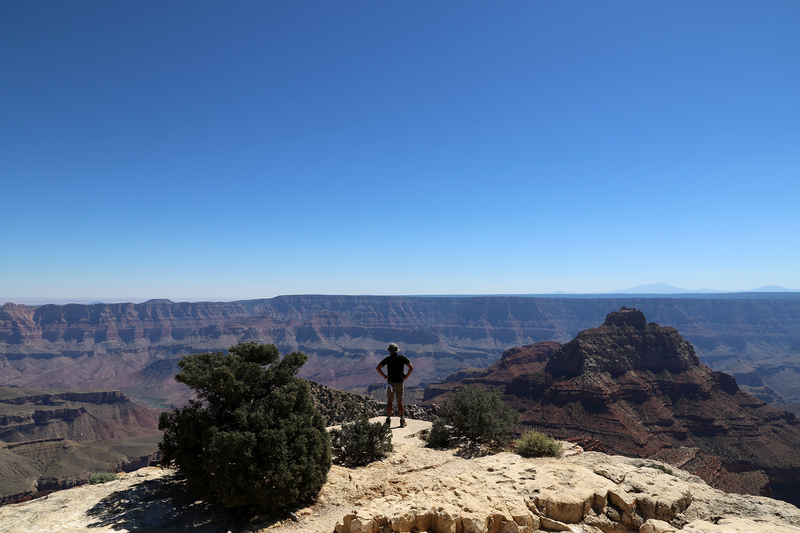 The scale of it just absolutely dwarfs Bryce Canyon, Cedar Breaks, or Zion. 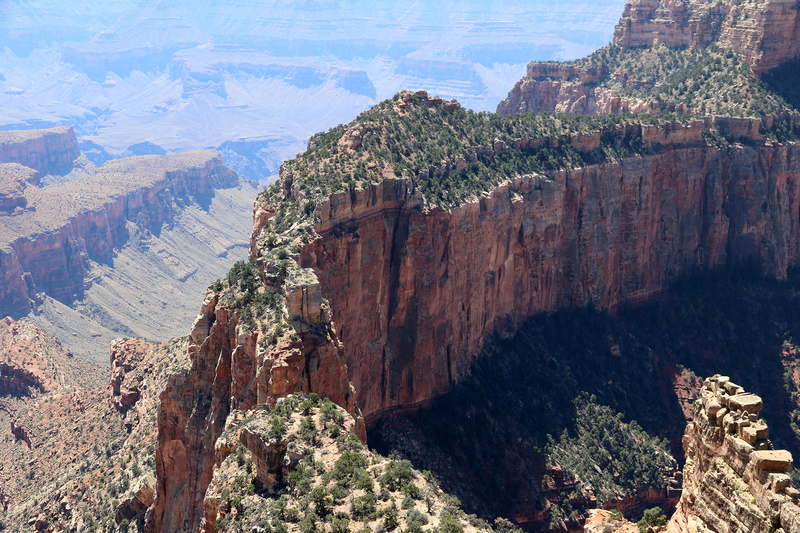 Or most other National Parks. 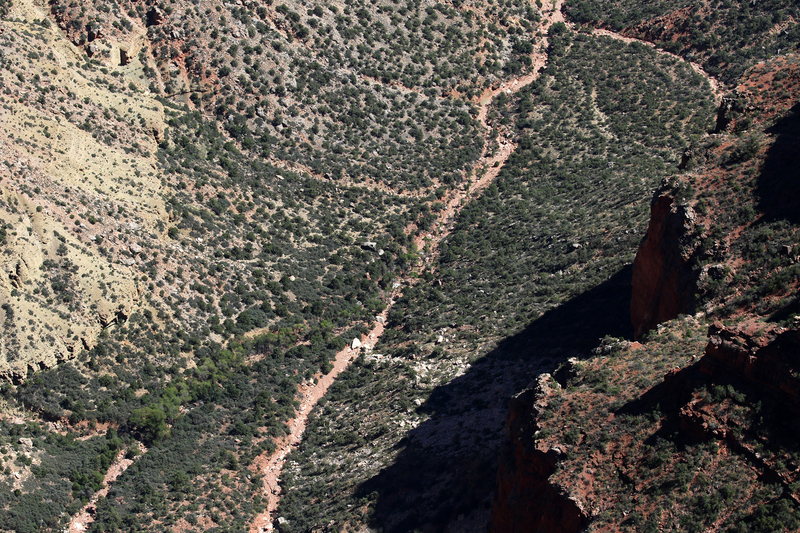 We walked back to the main path from Angels Window and continued south to Cape Royal proper. 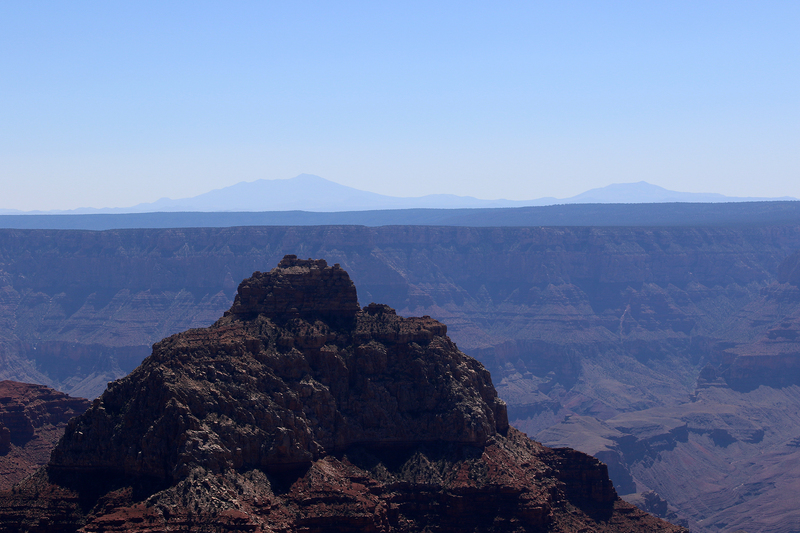 The view at Cape Royal is dominated by Wotan’s Throne, a huge butte immediately to the south connected to Cape Royal by a long fin of rock. 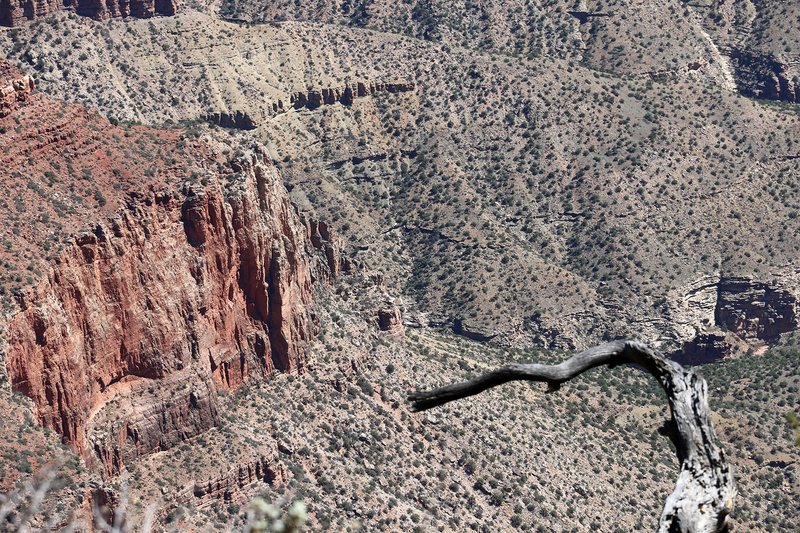 We drank in the view. 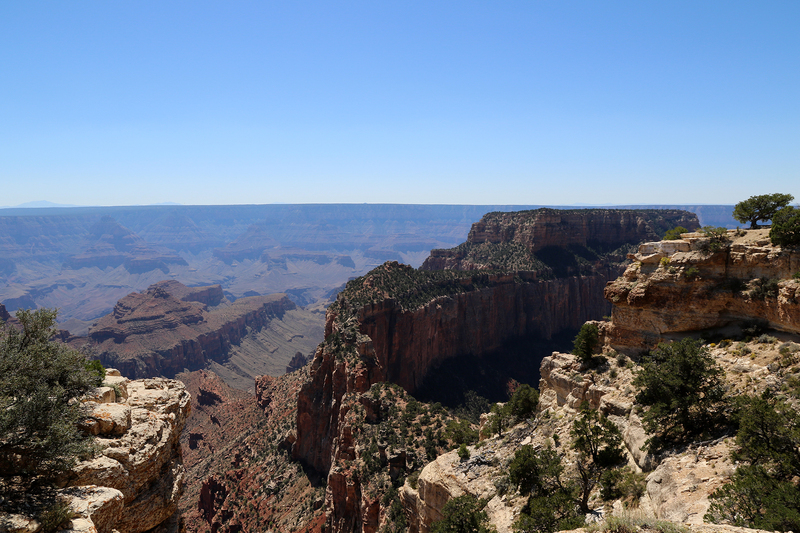 On the way back we noticed two gigantic boulders on the rim opposite Angels Window that may well tumble into the canyon soon (in geologic terms). 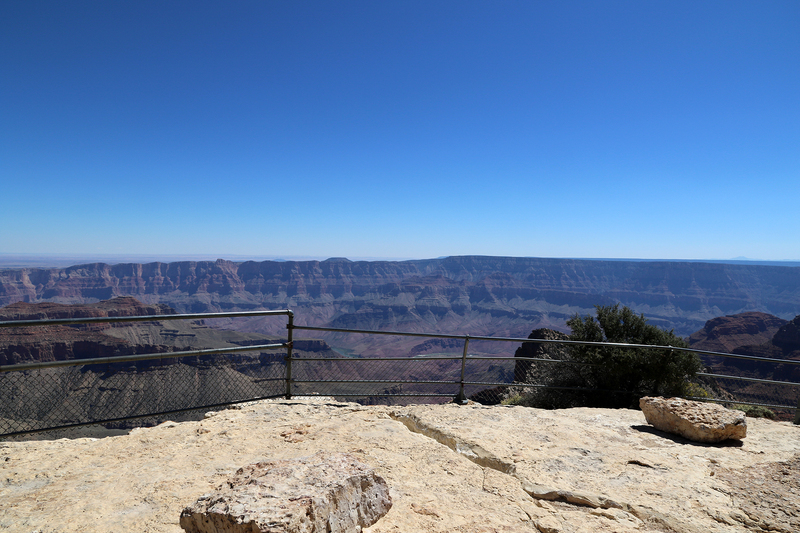 In all, we spent about an hour at Cape Royal, contemplating our first sweeping views of the Grand Canyon. 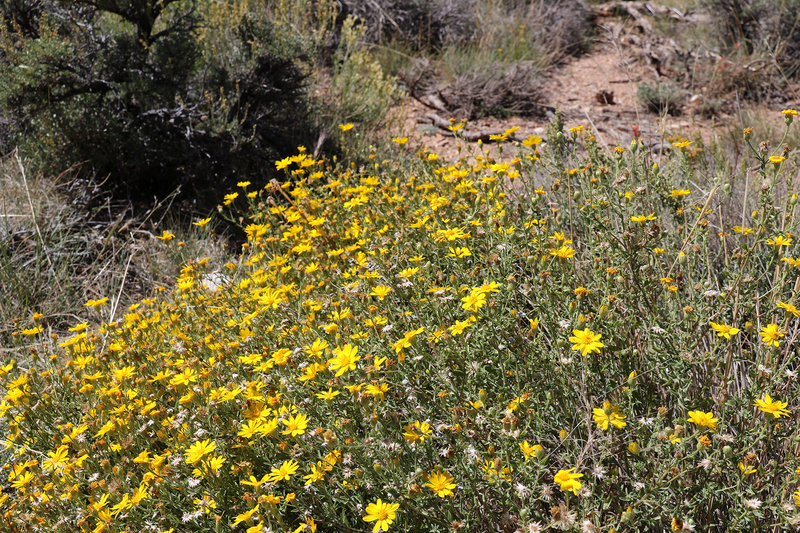 Now, it was time for a hike. 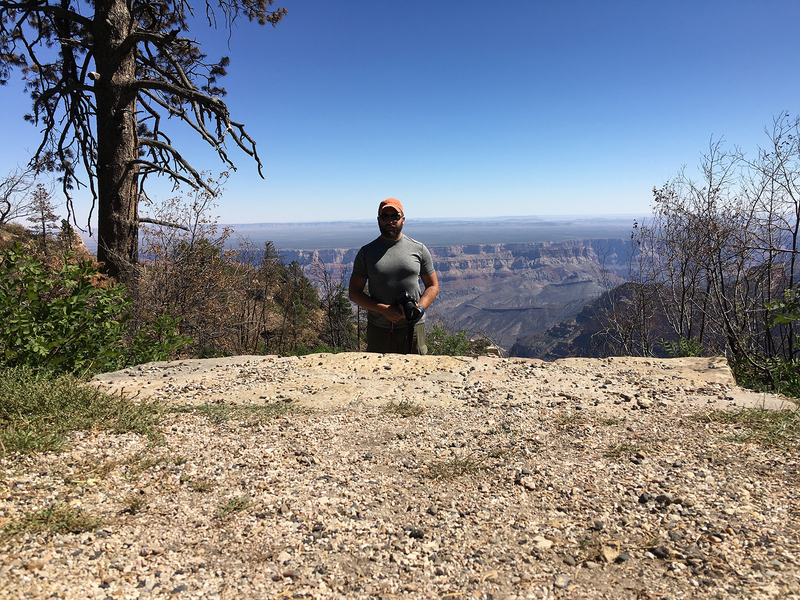 This entry was posted in Journey and tagged Arizona, Day Hike, Grand Canyon, Grand Staircase on August 4, 2017 by Brandon Hayes.